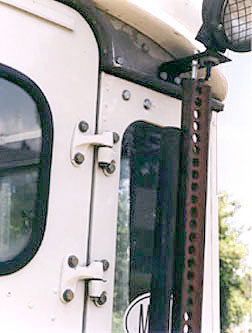 Hinge placement for rear lift gate. Two lower rear door hinges were used. NOTE: A bolt head sits on top of the Hi-Lift jack and connects to the rear work lamp bracket. This is to keep the lamp from vibrating and destroying the rear body panel.